Slick software and neat graphics. Hit the Craps tables at Drake! Drake Casino is a new site which has benefited from the slick modern software package provided by BetSoft. The site accepts customers from around the world including the US and, while it looks the part, this review will uncover its true value to Craps players. First up you can find a brief overview of the company before looking at the two Craps games offered on Drake Casino. Both games are covered looking at the key differences. Then you can check out the bonus offers from the site, along with the other games available. Finally you get the run down on the banking options and customer support. Drake Casino is a US facing site which launched in November 2012. The site is licensed and regulated in Curacao, among the Caribbean islands, a popular location for offshore gaming sites to base themselves. Most of Drake Casino’s games are powered by the BetSoft casino suite. This offers a fantastic range of games with state of the art graphics. There are no downloads required here as the casino is Flash based and runs in your browser. 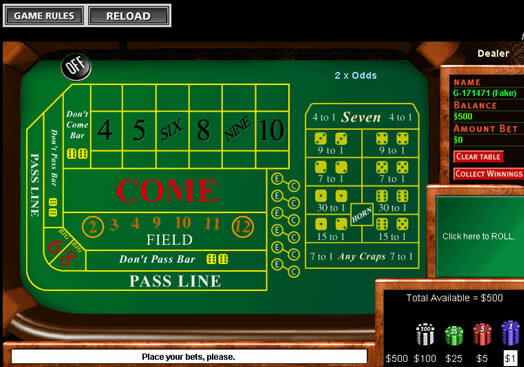 You can also find other non BetSoft games, completing a rich variety of choice. Drake casino has two Craps games available. The first uses Arrow Edge software, which runs using Flash. The table looks fairly basic and a bit dated although all the bets are clearly marked. It could be slightly easier to navigate with an empty frame off to the right rather than the straightforward ‘Roll’ button and no shading to indicate where you can bet. The table offers 2x Odds for Pass Line and Don’t Pass bets once you are into the point round. This is slightly disappointing as there are a considerable number of online casinos offering 3x. Field bets are not clearly marked on the table although they offer even money and 2:1 for 2’s and 12’s. While this is fairly standard there are sites offering 3:1 on 12’s. The maximum bet allowed in each section is $50 however the overall table limit is not listed. Overall the table does the job although it lacks features and does not compete with other versions in value or looks. Thankfully the site also has a BetSoft powered game. The graphics here look far better and the table limit is clearly displayed at $100, the same as the bet limits in different sections. Most importantly from a game play point of view, this table allows you to place 3x odds down when you are in the point round. As this is the only bet on the table which offers no house edge it makes sense to get as much on as you can. After playing on both for a while the only reason I can see not to choose the BetSoft table would be if your bets were consistently hitting the low table limit. Drake Casino does offer a Welcome Bonus which is a three part 100% match up to $5,000. 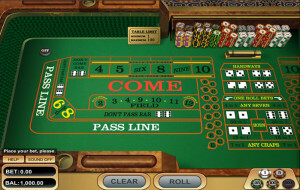 Unfortunately Craps is one of the few games that can play no part in clearing the bonus. If you do fancy clearing the bonus it has a reasonable 40x play-through requirement, although be aware that playing Craps with bonus funds may invalidate any current bonus so check the terms and conditions. Craps players can still get some extra value off weekly rebates up to 10% of losses and Drake’s loyalty scheme which awards points for each $1 you wager. These points can then be exchanged for casino credit or merchandise. With 6 tiers the more points you accumulate the higher rank you gain, resulting in yet more points. While these rewards are not huge they help take the edge off some losses. Aside from the Craps tables if you are playing on Drake you should really check out the great range of 3D slots provided by BetSoft. These state of the art games look fantastic and add completely different dimension to traditional slots games by including video sequences. 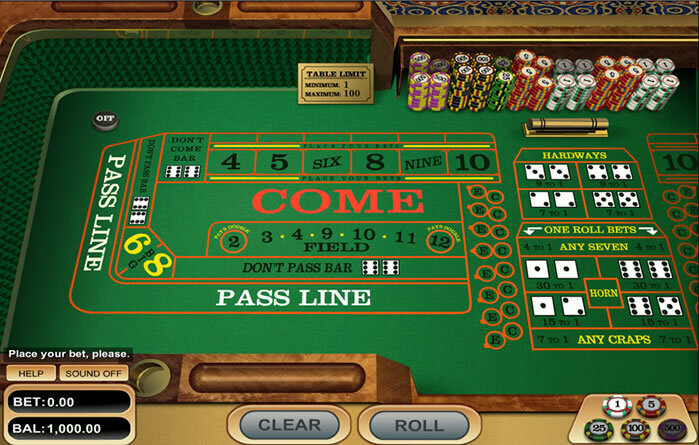 The site also hosts a wide range of table games and skill games including Gin Rummy. Drake Casino’s banking facilities only have four options, two of which are credit cards, so even international players may find it tough to get money online. However they do offer MasterCard as an option, which is not offered by many US facing sites. However one of the main concerns is when you try to take money offline. As withdrawing back to credit cards is no longer an option the site supports, receiving a check is the best option despite it charging $30 and requiring a $100 minimum withdrawal. If you have any questions regarding this or anything else Drake’s customer support is available between 0900 and 0000 EST via Live Chat, email or a phone call to either the US or International number. With two Craps games available offering different experiences to the users, and a wide variety of other casino games Drakes Casino could be a potential addition in any Craps player collection of sites. You can even gain some small value from the rebates and loyalty program. Unfortunately the limited and expensive banking options means the site is currently a no for me. With any luck this can be resolved in the future and the site can be recommended. No download required with browser Flash software. Only 2x Odds for Pass Line bets.